At 15 feet tall, the new hoop house for the Society for Ecological Restoration's UW Chapter (SER-UW) serves as a reminder of all the hard work 50 student volunteers put in over the course of six days. Working eight to ten hour shifts, students from UW’s Construction Management department, Sigma Lambda Chi and volunteers from SER-UW set out to construct a 30 foot by 48 foot hoop house at the Center for Urban Horticulture. Now, the student run native plant nursery has room for about 5,000 plants in the hoop house. The newly constructed hoop house was one of many goals the student group hoped to implement by this spring. 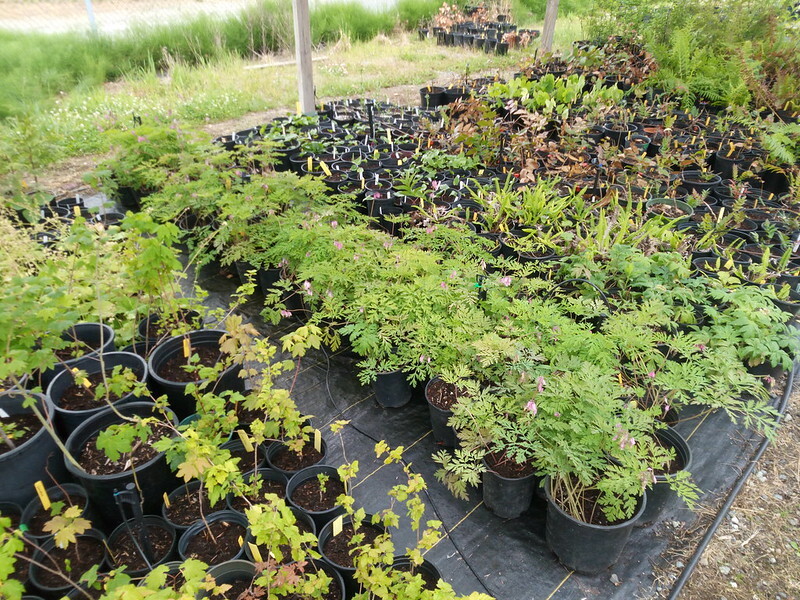 Last summer, the native plant nursery embarked on a mission to increase plant production, create an irrigation system, and install a pot-washing station. Thanks to a $54,000 Campus Sustainability Fund (CSF) grant, the student group was able to meet its goals on time. The previous nursery co-mangers, graduate students Anna Carragee and Kelly Broadlick, earned a 2016 Green Husky Award for their work with the native plant nursery, including laying out the vision for the nursery upgrades and securing the CSF grant. As a way to keep maintaining a successful plant nursery, the student group plans to apply for a second CSF grant. The goal is to create a management plan for running the nursery and a curriculum, including a series of 15-minute mini lessons for work party volunteers and a more expanded class for community members and interested students. The plant nursery has a steady stream of about 10 volunteers during its work party on Fridays, including students from ESRM 100 (the UW class requires a volunteering component). A frequent volunteer system has also been initiated to increase the number of volunteers each week. As a perk, volunteers who come to three work sessions receive a free plant. The plant nursery has over 2,400 plants, ranging from conifers and ferns to vine maples and twinberries. Depending on the season, the plant nursery and its volunteers complete specific tasks. For example, during the fall and winter months, volunteers go out and salvage plants from construction sites. Salvaged plants are used to restore areas like Whitman Walk and Kincaid Ravine on campus. Come early spring, planting seeds is the main focus. In the late spring, up potting begins. By the end of June, the nursery is done with plant work. The summer months are spent watering the plants. The nursery also hosts a plant sale in the fall and spring, with prices ranging from $3 to $30. Money accumulated from the plant sale goes towards buying soil fertilizer and other plant up keep materials. With the hoop house and other pieces in place, SER-UW is looking ahead to the next steps, including applying for another CSF grant to allow the group to work on educational outreach. The nursery hopes to partner with UW Botanic Gardens to teach classes on landscaping with native plants, pollinators, and more. Greene added, “There’s not very many formal horticulture experiences you can get on campus. We have a lot of potential in that we’re in a place where people can get hands-on learning experience."